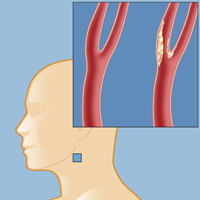 Carotid occlusion is one of the leading causes of ischemic stroke. A stroke, often called a "brain attack," is a medical emergency caused by either too little or two much blood flow to the brain. It's the third-leading cause of death in the United States and the second most common cause of neurological disability after Alzheimer's disease. Strokes are serious neurological emergencies that need to be treated immediately. A transient ischemic attack (TIA or "mini-stroke"), caused by carotid occlusive disease, carotid artery stenosis, or other conditions that prevent the brain from receiving the amount of oxygen it needs. Find out more about TIA by reading about carotid occlusive disease and related conditions that can cause a transient ischemic attack. An ischemic stroke is caused by a more severe blockage in a blood vessel, and is more serious than a TIA. Ischemic stroke is most often caused by advanced carotid occlusive disease, in which a clot forms in a narrowed artery and completely blocks the flow of blood to the brain (called thrombosis). The clot may break off from the narrowed artery and block an artery deeper in the brain (called an embolism). An ischemic stroke may also occur when a blood clot forms in the heart or other part of the body, ultimately preventing blood flow to the brain. Find out more about carotid occlusive disease and related conditions that can cause an ischemic stroke, or read about surgery for ischemic stroke. Ischemic stroke is more common than hemorrhagic stroke, and it generally occurs in those over 60. Risk factors for stroke include hypertension, high cholesterol, smoking, diabetes, drug and alcohol use, and a sedentary lifestyle. 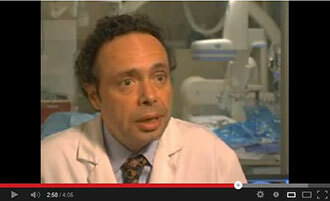 Find out more about the Stroke Program at the Weill Cornell Brain and Spine Center.